I have now completed the first version of the Calculator for Speaker Requirements, for home theater and sound reproduction. By entering data for room and speakers, the sound pressure level can be estimated to verify if the speaker configuration has sufficient output to meet the chosen required listening level. A graphical presentation shows the current status, and provides point and click access to each speaker configuration section. 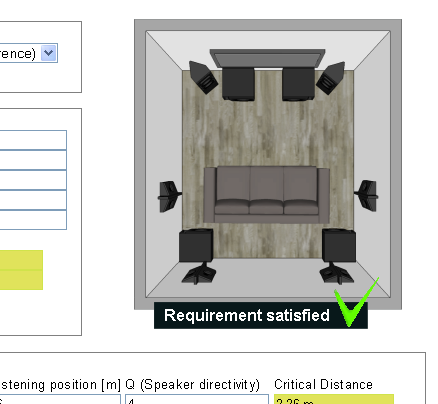 Speakers that do not meet requirements are indicated, it is easy to get an overiew of the current situation. The most difficult part was to decide how to calculate the reverberant sound field contribution - the sound that is added by the room itself. The chosen method is approximately valid for relatively small rooms that are acoustically well damped, with reasonably normal height-length-width relationship. For larger spaces or odd room shapes the model may be less accurate. With this tool it is quite straight-forward to check whether a chosen speaker set will be usable, and also see how much amplifier power is needed. This is very useful for subwoofer configuration - add or remove different subwoofers and see the results immediately. It is easy to see that the most difficult requirement is the subwoofer. Reference level with a nice house-curve lift at the lowest frequencies will require massive output capability, most likely several powerful subwoofers must be used. Tooltip provides additional information for many of the different data items. The loudest listening level is selected, this forms the foundation for the rest of the requirements. Level can be chosen from a set of predefined values. There is a reason for not using just a number to be entered - the range of values now reflect the level of accuracy one can expect, there are also descriptions for the different levels, and steps of 3 - 6 - 10dB are appropriate, as these levels provide suitable steps in loudness to span the range from reference (quite loud) to a lower -20dB. Now, these are meant to be the systems maxiumum design requirement - that does of course not mean that one always must listen at these volumes. Even -20dB may be too loud sometimes, and for quiet movie or documentary both the dialogue and sound effects should be clear and easy to understand at, say, -40dB. But you don't dimension the home theater for that. Dimensions and acoustic data for the room is used to calculate the resulting sound. Here the reverberation time T60 may cause some uncertainty, regarding what value should be entered. If the theater has not been built yet, how can you measure it. The answer is, you do not need to measure it, you determine the value instead, and thereafter fix the room with acoustic treatments to reach that value. A T60 around 0.25 or lower is nice for the smallest rooms, 40-60m3, or 12-20m2. Larger rooms have longer reverberation, 0.3 and up to 0.4 can still be usable for rooms up to 40-60m2. Distance from listening position to speakers determines how much attenuation there is in the direct sound. 1: Omnidirectional 4π radiating. Subwoofer or normal speaker at low frequencies. 2: 2π radiating. Recommended for wide dispersion surrounds (180°). 3: Dipole, and normal radiating. Recommended for mains L,R with low directivity - direct radiating mid and tweeter. 4: 45° radiating. Recommended for mains L,R with higher directivity - horns, waveguides. The critical distance, calculated based on room data and speaker directivity, is displayed. This is the distance where the reverberant field and the direct radiated sound are equally loud. Beyond this distance, the sound from reflections around in the room will be louder than the sound that comes directly from the speaker. Defines how to calculate subwoofer sound pressure level. When main and surround speakers are set to Small - routing the sub frequencies to the subwoofer, the required capacity for the sub must include the added signals. House curve means a customized frequency response target with a boost at the very low end, starting typically at around 50-100hz, full level at 20Hz. Clearly this will also add to the required spl form the subwoofers. Since the main and surround channels are very unlikely to have full level low-frequency content, the level of contribution can be adjusted. Loss means correction from 1m/2&pi; specification to in-room at listening position. The actual correction will vary according to room construction and size, and subwoofer location. A range of typical values can be selected, and when set to "Use distance" the spl is calculated using reverberant field and room data. Sensitivity for the speakers must be specified, as measured at 1m with 2.83V. Often specified as dB SPL/1m/1W, as 2.83V equals 1W into 8 ohm load. Some speakers are 4 ohm, and in some cases sensitivity is given for 1W into 4 ohm, then add 3 dB and you have the sensitivity for 2.83V. Actual SPL at listening position is calculated using the entered Actual Power. The Power calculated is the required power to reach the required spl. Four different subwoofer types can be selected, in any reasonable number. The configuration table allows for quick and easy overview of different subwoofer configurations. For subwoofer specification, the maximum spl at 20Hz, measured at 1m distance 2π (groundplane) must be used. Make sure the value you use is a real, measured value, and not some marketing number. Most subwoofers will be a lot more powerful at higher frequencies, like 60Hz, than at the lowest 20Hz and below, so be aware of getting the right spl number, you want the one for 20Hz. If the specification is for 2m groundplane, just add 6dB to that value to get the 1m/2π. The calculator is useful both for new and existing installations. Due to flexibility in what data may be entered, there will always be a way to get approximate information about performance.